Kudale Calibrations Lab Pvt. Ltd. 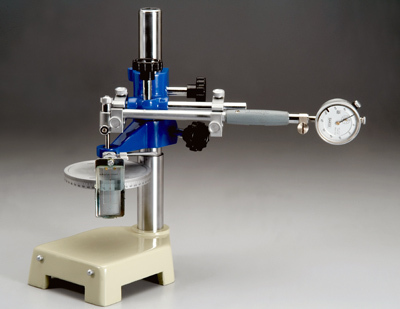 Useful for periodic calibration of plunger type, lever Type dial gauges and bore gauges. Available in imperial and metric systems. 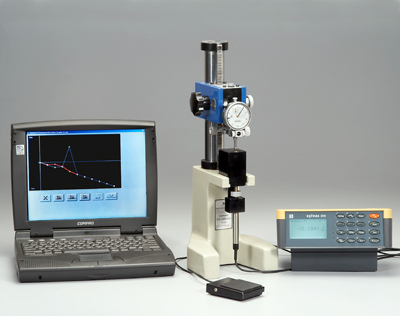 Useful for periodic calibration of plunger type, lever Type dial gauges and bore gauges. Useful for periodic calibration of plunger type and lever type Dial gauges and bore gauges. The unit can be computer interfaced with user-friendly software for statistical analysis of measured values. Useful for checking total composite error, tooth to tooth error of Helical and Spur Gears. Useful for checking total composite error, tooth to tooth error of Helical and Spur Gears. Maximum Center Distance 100 mm and 150 mm respectively. Useful for checking total composite error, tooth to tooth error of Helical and Spur Gears. Maximum Gear diameter 200 mm. The High Center Attachment (column) is available for inspection of shaft gear of length up-to 250 mm, as an optional accessory. Useful for checking total composite error, tooth to tooth error of Spur and Helical Gears. Available on demand the attachments for shaft gears, worm gears and Bevel gears and short center attachment for smaller gears. Center Distance 60 mm to 320 mm. Short center Attachment is available to inspect the gears with Center Distance 25 mm. Shaft Gears up to Length: 700 mm max. also can be inspected. The indexing fixture is offered on Gear Tester, Model P-1 and P-2 only. The fixture is useful for inspection of shaft gear. With the fixture maximum 5 Nos. of Master Gears are mounted on different mandrels at a time and gears on shaft can be inspected one-after-another by meshing with the respective master gear. Useful for checking total composite error, tooth to tooth error. Available on demand the attachments for shaft gears, worm gears and Bevel gears and short center attachment for smaller gears. Center Distance GRT-P2 40 mm to 350 mm Shaft Gear Length: 700 mm max. 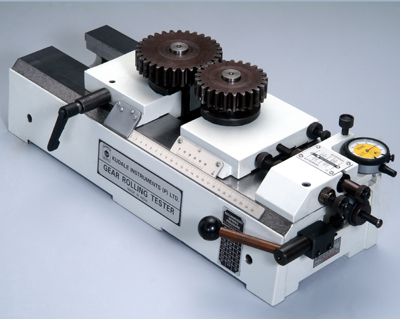 The Bevel Gear Tester is useful for inspection of bevel gears in double flank method. The measurement of clearance of gear flanks and detection of bearing areas, inspection of composite error and checking of assembly distances are the applications of this instrument. Maximum bevel gear diameter 140 mm. Angle adjustment of axes 50° to 140°. Bevel Gears with min. assembly distance of 35 mm and Maximum assembly distance of 140 mm can be inspected. 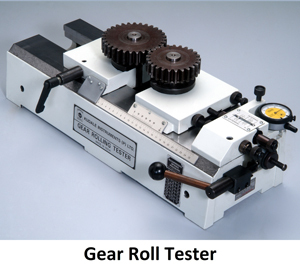 The fully automatic Computerized and Motorized Gear Roll Tester is useful for inspection of total composite error, tooth to tooth error and Run out of gears. The test report is generated in graphical format and indicating unit shows the accept / reject results based on pre-determined entered values. The high spot pen marking attachment is also offered as per demand. This instrument is offered with our models P-1 and P-2. The scale and Tape calibration unit is useful for calibration of measuring tapes and scales. The Range of unit is 1000 mm. with the Least Count of 0.005 mm. The instrument is fitted with high precision scale and Digital Indicator. The CCD Camera catches the image of measurement line on scale or tape, under calibration and the same is displayed on small video screen. Useful for checking Internal Diameter, Groove Diameter of Bore, Plain Internal Diameter, Internal Tapered diameter, Internal Pitch diameter and internal raceway diameter of machined parts. Measuring Range (Diameter): 4 - 67 mm. Measuring Range (Height): 0 - 12 mm. This instrument finds its application on shop floor as well as in the Gauge Room for inspection of Internal Diameter, Outside Diameter, Run-out, Composite error of gears, Thickness etc. parameters of machined parts. The instrument is popularly used on shop floor as a comparator for stage inspection and final inspection. We offer special tooling on the instrument as per customer requirement to meet inspection requirement of the components. The instrument is used for various vital acceptance parameters of Piston. The parameters such as Ovality, Taper over the length and angular difference between major and minor diameter of Piston can be checked. The instrument is provided with high accuracy electronic probe, digital indicating unit and specially designed software to check the above parameters of pistons. The test data can be stored on PC. The Roundness and Cylindricity Tester, Model Rondcyl 500 has been designed to meet manufacturers requirement for fast, high accuracy, simple operations and at a price that can be justified. The geometrical parameters viz. Roundness, Cylindricity, Concentricity, Co-axiality, Flatness, Perpendicularity, Plane Run Out, Parallelism can be tested. Maximum diameter 500 mm. Max. Weight: 25 kg. The instrument is operated through comprehensive user friendly software. Kudale Instruments. All rights reserved.